"This recipe was given to me by a friend and they are amazing! 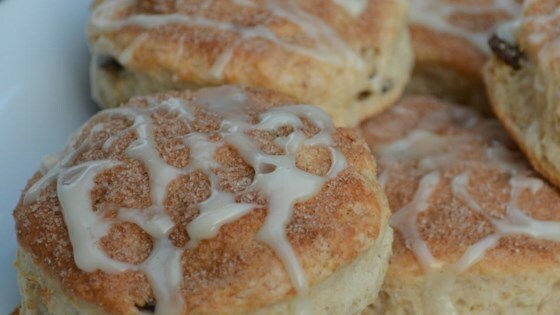 Think half cinnamon roll, half biscuit, and wholly delicious!" Stir white sugar and cinnamon together in a bowl. Combine half the sugar mixture, flour, baking powder, baking soda, and salt together in a separate bowl. Cut butter into flour mixture using a pastry blender until mixture resembles coarse crumbs. Make a well in the center of the crumbly mixture; add yogurt and raisins to the well. Stir just until dough clings together. Turn dough onto a lightly floured surface and gently knead 8 to 10 times. Roll dough into 1/2-inch thickness and cut with a 2 1/2-inch biscuit cutter. Arrange biscuits on a baking sheet; sprinkle with remaining sugar mixture. Bake in the preheated oven until lightly browned, 10 to 12 minutes. Whisk confectioners' sugar and orange juice together in a bowl until icing is smooth; drizzle over warm biscuits. You can substitute the orange juice for water or milk, if needed. very good and fluffy. I prepared a quicker way and didn't roll out the dough, instead I just used a muffin pan and rolled up a couple balls for each and voila! delicious. These tasted good but were very flat...followed the directions exactly so not sure why they didn't rise much. It was great. Hubby loves it. I don't do the icing, only put sugar and cinnamon mixture as topping. Sometimes I use 1c wheat flour n 1c white flour. Still tastes great!! !